(Santa Mariña de Lañas-Arteixo, A Coruña, 1959) He has been living in Zaragoza since autumn 1978. A cultural journalist at the Heraldo de Aragón, he has been the editor of the Artes & Letras supplement since 2002. He has published about 30 books of fiction, poetry, journalism, biography and essays. With Destino he published four books of fiction; in 2011 Xordica re-published the short story volume El testamento de amor de Patricio Julve. In 2013 he released El dibujante de relatos (Pregunta), with illustrations by Juan Tudela. 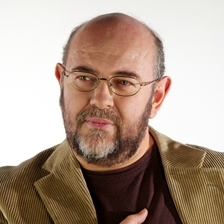 He is the author of four poetry collections: Vivir del aire (Olifante, 2010), El paseo en bicicleta (Olifante, 2011), Seducción (Olifante, 2014) and El musgo del bosque (Prensas Universitarias de Zaragoza, 2016). He has published books for children and young adults, including El niño, el viento y el miedo (Nalvay, 2013), La leyenda de la ciudad sumergida (Nalvay, 2014), and El tango de Doroteo (Libros de Ida y vuelta, 2017), illustrated by Javier Hernández. In 2012, the coming-of-age novel Cariñena (Ediciones 94) come out, and this was re-published this year by Pregunta. In 2017 he brought out a new, expanded edition of his short story book Golpes de mar (Ediciones del Viento, 2017), the book of a life. He has also published, together with the naturalist and photographer Eduardo Viñuales, the volume Aragón. Excursiones a lugares mágicos (Sua). In 2013 he received the National Cultural Journalism Prize. He presented a number of cultural programmes on television: Viaje a la luna, on Antena Aragón; El Paseo on Heraldo Televisión; and Borradores, on Aragón Televisión; between 2005 and 2012. He contributes to several Spanish magazines including Eñe, Librújula and Mercurio.